Students and staff at Leaning Tree Community School have recently learned about relaxation, gravity, yielding through Cheng Hsin training. The students learned some basic Cheng Hsin body being principles, the first moves of a Tai Chi set and played lots of games during their weekly ‘clubs’ for an hour on a Wednesday afternoon. Imagine going to school and having a visitor teach you to relax by having your classmate flop your arms around like a loose piece of meat, learn to move your body more effortlessly by imagining you are an alien pinned to the ground by gravity, or learn to move like Neo from the Matrix by yielding to pressure from your training partner. Even better to imagine doing this if you are a teacher on a professional development day! The children seemed to thoroughly enjoy the classes, especially the interactive games where they were able to train each other in relaxing or yielding. Who would have guessed that flopping your arms around or poking your partner in odd places could yield such insights! Hopefully it’s not the last time we train Cheng Hsin at Leaning Tree. The ethos and intention of the school is very aligned with the sort of holistic, nuanced and intelligent approach to body being and effective interaction that Cheng Hsin enables. Perhaps this could expand to other schools or workplaces too? Cheng Hsin has been so well-received in Geraldton already. A few things stand out from the experience of preparing, offering and running the first few training sessions. Grounded Openness — Everyone including PCYC staff, experienced martial and tai ji practitioners, professional athletes, yogis, school-teachers and friends have all been so interested, open, inviting and accepting of this new art to Geraldton. Inquiry and Insights — It’s the nature of Cheng Hsin practices and principles to yield fresh insights into being and interacting. However it’s one thing to experience that yourself, it’s another thing to be able to share a simple game and find that others have similar insights. Whether it’s relaxing, yielding, or simply feeling the constant pull of gravity, undertaking these simple ‘physical’ investigations has lead to insights into those that doing the inquiry. Play (for itself) — Participants so far seem to be open to the possibilities of Cheng Hsin as a martial or physical practice, but also sense the value of doing the “playful” investigations for themselves. That is, each game, principle or structural point we investigate and play with is of value on its own to have an authentic and direct experience of a different way of being or relating….even if no additional work was done to make it a purposeful martial technique. Gratitude — Without Peter Ralston, there would be no Cheng Hsin. Without the enthusiasm and hard work of previous apprentices, we wouldn’t have the books, videos and history. Without the books and videos, we wouldn’t have the forms to discover the essence. Without the workshops and e-courses with Peter we would be mistaking forms for essence. And without the continued (remote) support of Peter and his apprentice Brendan it would be much more difficult to experience, communicate and share the practice. It’s with this sense of There also seems to be a very strong spirit of appreciation amongst those who are attending. It’s wide open for everyone at the start of this journey. We have a mix of participants and are able to address body being, effective interaction and martial studies in each training session. The breadth of applications are ultimately inseparable as a singular singular experience that is Cheng Hsin. Join us, each Tuesday 5:30 to 7pm. 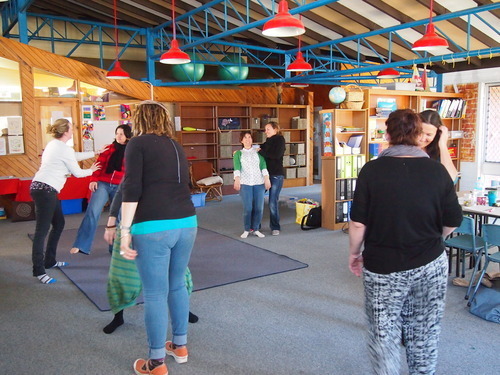 Action shots from the opening workshop in Geraldton, held earlier this month. A great evening full of grounded inquiry, open learning and insights through interactive games. These themes have already continued in our regular sessions now on TUESDAYS 5:30 to 7pm at PCYC.